Are Uber and Airbnb Killing Innovation for Everyone Else? 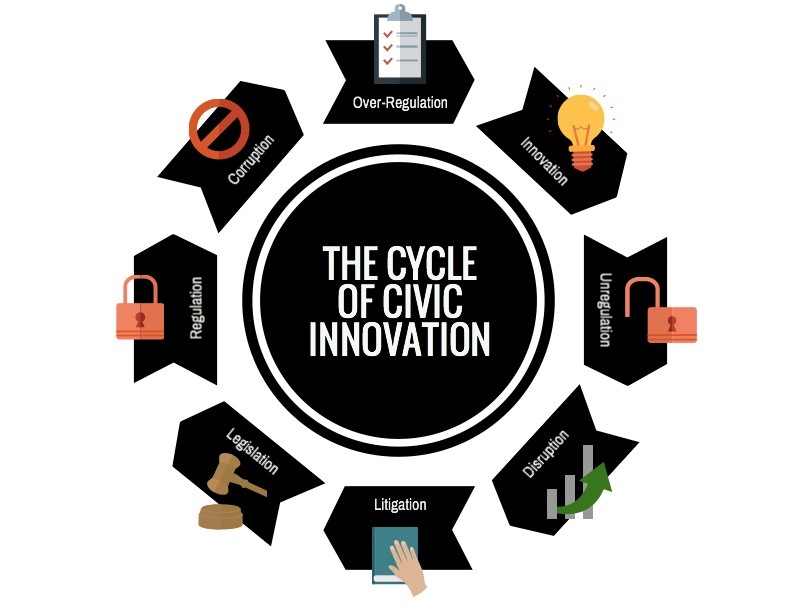 If cities are to thrive, they cannot - and must not - hold back the rising tide of innovation, but when you consider that cities are also tasked with protecting their citizens from harm, finding the balance between protection and innovation is not easily achieved. For Airbnb and Uber, their respective disruptions of the status quo were widely embraced by the public - just as their problems have been widely criticized. Both companies are part of the Sharing Economy, which came on the scene around the turn of the century and encompasses a wide variety of companies based on peer-to-peer sharing of access to goods and services. When Brian Chesky and Joe Gebbia came up with the crazy idea of using a few air mattresses on the floor of their apartment to sell sleeping spaces to attendees of a sold-out tradeshow, both were unemployed and just looking to make a few bucks to pay their rent. Their impromptu "Air Bed and Breakfast", complete with un-toasted Pop-Tarts, landed three paying guests - and the short-term rental platform, Airbnb, was born. While a majority of visitors have had positive experiences using the platform's services, an increase in reported mishaps, injuries and crimes have lawmakers concerned. In fact, many cities are not making it easy to operate an Airbnb rental, including global tourist destinations like Paris, Amsterdam, London, San Francisco and New York City. Taking it a step further, some city and state governments are pursuing legal action, with one New York City apartment owner now facing a $300,000 lawsuit filed by the owners of her building in response to a city administrative law judge fining the landlord for their tenant's "bad acts". In addition, the company's pledge of transparency and release of New York City data was lauded by many as a step in the right direction. But others, like Mark Headd, a longtime advocate for open data and government, pointed out that the release of data is only one small step in the right direction, especially since the data was never published in a digital format. In fact, anyone wanting to view the highly redacted data had to do so in person at Airbnb's New York office. Eric Posner points out in his 2015 essay that something quite similar happened to the taxi industry in the 1920's with the introduction of the mass-produced automobile. In New York City, riders hoping to avoid the higher cab fares would hail part-time drivers who were using their own personal vehicles. Today's taxi drivers often spend years paying off loans to afford their medallion, which until recently cost over $1 Million - and it is the cost of those medallions which many attribute as the catalyst for the success of today's new ride-sharing companies like Uber. In today's rapid pace of technology changes, cities have discovered they cannot innovate fast enough to keep pace with the constantly changing smart city and civic tech inventions which are already beginning to deliver more efficiency and easier access to city services and information. Many government agencies are partnering with this new breed of tech startups despite the barriers of outdated 20th Century regulations by implementing new procedures to experiment or implement pilot programs. As more cities disrupt their own established procurement processes, the question is whether cities will become tomorrow's disruptive innovators. If cities can collaborate with private enterprise to keep pace with new technologies while simultaneously addressing needed changes to regulations - we might be witnessing the best disruptive innovation yet.